As Houston and the Heights have grown and changed over the past 100 years, so has the membership of St. Andrew’s Episcopal Church. St. Andrew's Episcopal Church has a 100-year history in the Houston Heights. Although St. Andrew's was not the first Episcopal Church in the Heights, it was the first to have a church building. Episcopalians began worshiping in the Heights in 1895. Until 1904, divine worship was conducted by Reverend Benjamin A. Rogers. Services were held in the Cooley Elementary School building, and the congregation was known as St. Stephen's Mission. The Priest-In-Charge of St. Stephen's, Reverend Rogers, is known in the history of the Episcopal Diocese of Texas for several reasons. He was the only clergy member of the Diocesan Board of Trustees, which in 1889 adopted the charter incorporating the Council of the Diocese under the title Protestant Episcopal Church of the Diocese of Texas. He presided over the Diocesan Council held in May 1892 in Waco in the place of Bishop Gregg, who was ill at the time. It was at this council that Bishop Kinsolving was elected to assist Bishop Gregg. On a Sunday afternoon in February 1911, St. Andrew's was organized as a mission of the Episcopal Church in the parlor of Reverend and Mrs. Henry Justus Brown's home at 212 West 19th Street. Trinity Episcopal Church sponsored St. Andrew's Mission. Reverend Benjamin Andrew Rogers was honored in the choice of his middle name for the new congregation. When the worshipers grew too numerous to gather in the Brown home, Mr. Fred Dexter offered the use of his hall. The first church building on Allston Street was erected soon after, and it served the congregation well until 1920, when Mr. O. M. Carter, owner of the Houston Heights Land Company, gave St. Andrew's some property at the corner of 19th Street and Yale Street. 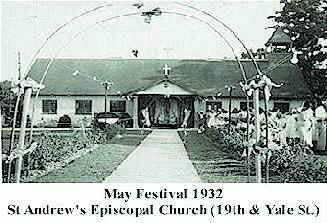 At the 1921 Diocesan Council held in May at Christ Church Cathedral, St. Andrew's Mission was granted parish status. The first official rector of St. Andrew's was Reverend Edward Farren Hayward. Many happy memories were made during this time, and St. Andrew's parish continued to grow and flourish during the 1920s, 1930s, and 1940s. By the mid-1940s, it was clear that St. Andrew's needed an even bigger space. Land at the corner of 19th Street and Heights Boulevard was obtained, and ground was broken in 1947. 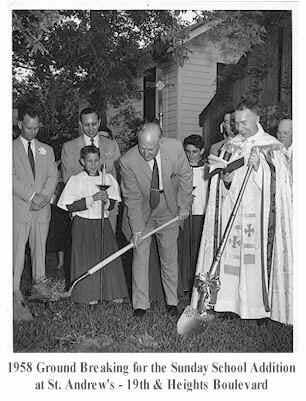 Haskin V. Little became Rector of St. Andrew's Episcopal Church in 1952. In 1958, a Sunday school wing was added to the back of the church building to serve the growing population of Sunday school attendees. As in most large metropolitan areas, a large part of the population base moved to the suburbs during the late 1950s, 1960s and 1970s. But St. Andrew's was in the heart of Houston, and its loyal parishioners drove from all points to stay in the St. Andrew's family. Reverend John E. Binford became St. Andrew's rector in 1978. For most of his 22-year tenure as rector, St. Andrew's enjoyed the resurgence of popularity in the Heights as many people began restoring old homes and moving their young families closer to downtown. The church building on Heights Boulevard, however, remained essentially unchanged until 1993, when St. Andrew's launched a massive renovation program entitled Achieving New Heights. Achieving New Heights was a great success. Many changes were made to the structure of the church: an elevator was installed, the parish hall and kitchen were enlarged and remodeled, new offices were built, Sunday school rooms were renovated and enlarged, and a new, indoor chapel was dedicated whose centerpiece is a dramatic, back-lit, stained glass window from the former Good Shepherd Episcopal Church. Reverend Paul Fromberg became the rector of St. Andrew's in February 2000. Membership grew, and a mission statement was created. The first church picnic and the first vestry and church leaders retreats were held at Camp Allen. The Celtic Festival was begun, and St. Andrew's became active in the Houston Heights Association. During this time, St. Andrew’s Episcopal School was founded. This school is a ministry of St. Andrew's Episcopal Church to the Heights and Houston area with a commitment to providing the community a program that nurtures the growth of both the family and the child. The Reverend Barbara Lewis was installed as rector in October 2005. She continued St. Andrew's legacy of community connection and spiritual growth and led the parish into our second century of ministry in the Houston Heights. A book chronicling the complete history of St. Andrew's Episcopal Church, authored by Anne Sloan, was published in 2010 in honor of the parish's centennial. The parish celebrated its centennial in 2011 with a series of community events. Highlights included a visit by Presiding Bishop Katharine Jefferts Schori and the dedication of a Texas historical marker commemorating the parish's history. The church continues to focus energy on community outreach and Christian education for all ages. St. Andrew's is approved for Same-Gender Blessings by The Right Reverend C. Andrew Doyle / IX Bishop of Texas. Rev. Lewis retired. The Reverend James (Jimmy) Grace was installed as rector in June 2014. St. Andrew’s adds a third Sunday service, Rhythms of Grace. Directed by Lisa Puccio, Coordinator for Special Needs Worship and Family Formation, Rhythms of Grace is a worship service with Eucharist for families with children of differing abilities. The Rev. Carissa Baldwin-McGinnis joins as part-time Associate Rector. Choristers Choir for boys and girls is established using the Voice for Life curriculum. CLICK THE IMAGE ABOVE TO VIEW THE BROCHURE.